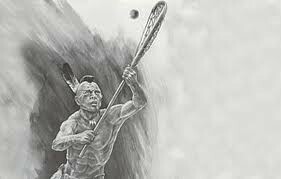 Lacrosse, referred to by the First Nations as the “Creator’s Game,” is considered to be North America’s first sport, was born of the First Nations, christened by the French, and adapted and raised by the Canadians. Modern lacrosse has been embraced by athletes and enthusiasts of the United States and the British Commonwealth for over a century. The sport of lacrosse is a combination of basketball, soccer and hockey. Anyone can play lacrosse - big or small. The game requires and rewards coordination and agility, not brawn. Quickness and speed are two highly prized qualities in lacrosse. An exhilarating sport, lacrosse is fast-paced and full of action with abrupt starts and stops, precision passes and quick shots are routine in men's and women's lacrosse. Lacrosse is played with a stick, the crosse, which must be mastered by the player to throw, catch and scoop the ball. The Canadian Lacrosse Association, established in 1867, adopted Beers’ rules. The same year, a team from Kahnawake, near Montreal, went to England and played a game for Queen Victoria. The sport quickly became popular in such locales as Bristol, London, Cheshire, Lancashire, Manchester, and Yorkshire. The English Lacrosse Union was organized in 1892. Today, lacrosse is played in two distinct versions: Box Lacrosse and Field Lacrosse. Box lacrosse began in the 1930s as an opportunity to use arenas during the hockey off-season. Box is played indoors in a 6-on-6 format (1 goalie, 5 runners). Box lacrosse is physical and dynamic and in many ways closely resembles hockey. Box lacrosse is very popular in Canada where hockey players use Box to develop their hockey skills. Box is a very creative game that requires strength and agility. Field lacrosse is played outdoors in a 10-on-10 format (1 goalie, 3 defenders, 3 midfielders, 3 attackmen). It is a great game for both boys and girls of both athleticism and skill. Field lacrosse most closely resembles the original First Nations game. It is much less physical than box lacrosse. Today, lacrosse is played throughout the country with the Mann Cup representing the pinnacle of Canadian Box Lacrosse. The National Lacrosse League (box lacrosse) and Major League Lacrosse (field lacrosse) are professional leagues that are played in front of thousands of fans. Ontario remains to be the source for many of professional lacrosse players. Worldwide, teams from Europe, Australia and New Zealand compete for World Championships in both field and box lacrosse. Canada is a perennial contended on the world stage in both field and box lacrosse and with a number of athletes representing the Ottawa region.